Mowing your lawn can be a timely and strenuous responsibility. If you have a large yard, it can be doubly strenuous. But, there are mowers available that can cut down the amount of effort and time that you put into mowing your yard. Zero turn mowers are much faster than normal riding lawn mowers, and are capable of cutting grass over long stretches as well as in tight corners. If you find lawn mowing to be more of a chore than a relaxing activity, you might be interested a zero turn mower. You’ll hit hard-to-reach corners, cut your mowing time in half, and may even have some fun doing so. Husqvarna is a company responsible for many of the top zero turn mowers on the market today. They have manufactured mowers in all different sizes and with all different mowing capabilities. The company’s top zero turn mower at the moment is the Husqvarna 61-Inch MZ61 27 HP Zero Turn Mower. It combines power and size to create a monster of a lawnmower, capable of mowing large or medium sized yards in very short amounts of time. Let’s start by talking about the mower’s deck. Made of fabricated steel, the deck is very thick and durable as it can take a lot of abuse and keep on going. This makes it a great deck for mowing commercial properties which might have uneven and rough terrain that can cause damage to the mower. However, due to the size and power provided by the mower, this deck would also be just fine if used in residential settings. The deck is 61 inches and encloses 3 cutting blades, offering you a large amount of cutting area, and protecting you from flying objects. A pedal attached to the deck adjusts its height, and can be accessed from a sitting position while you are mowing, offering you a great deal of convenience and usability. The mower’s engine, a 27HP/810cc Briggs & Stratton Endurance V-Twin Engine, runs very powerfully, but is still fairly quiet for an engine of its size. You will have no problem cutting dry, or wet grass with this mower. The mower’s design gives the engine plenty of room to breathe, allowing for plenty of airflow, and ensuring that the engine does not overheat. At its top speed, the mower can travel at 8 miles per hour, allowing you to whisk from one size of the yard to the other in very little time. This will greatly cut down the time it takes to mow. The mower can also travel at much lower speeds, however, making it great for trimming around tight edges. It’s run on gas, and has an excellent oil lubrication system that keeps the blade moving smoothly at all times. Online reviewers love this mower for how smooth of a ride it has, stating that it can travel at high speeds without sacrificing any comfort. They also enjoy how well it can maneuver, with one reviewer noting how well it mows around the hundreds of trees that he has in his yard. A negative comment made by some reviewers was that the mower does not possess a brake pedal. It is completely controlled by a lever that adjusts the speed of the mower. People who don’t have a lot of experience with zero turn mowers might have trouble trying to control this mower when they first start using it, though most users have gotten used to it over time. Another complaint about the mower is that it’s not easy to clean grass and debris from under its deck . At its heart, the Husqvarna 61-Inch MZ61 27 HP Zero Turn Mower is a mower that provides a great deal of cutting power, yet doesn’t sacrifice comfort. Its ability to maneuver at many different speeds makes it a great mower for yards of all sizes, whether commercial or residential. If you have a huge yard, or are looking to start a landscaping business, the Husqvarna 61-Inch MZ61 27 HP Zero Turn Mower is definitely one to take a look at. It can be purchased for around $5,000.00 on most online retail sites. Husqvarna hits our list for the second time with another high quality zero turn mower. This time, we’re discussing their Husqvarna 54-Inch 26 HP Kohler 7000 V-Twin Zero Turn Mower. It offers the same quality afforded to you by the 61-inch, but is created to suit smaller yards. If you’re an owner of a large residential property, this mower could be the answer to all of your yard care prayers. First, let’s talk about the mower’s deck. It made of stamped steel, which is thinner than fabricated steel, but which still offers a great deal of protection to you and the world outside of the deck. This deck will probably not hold up the best if used for commercial mowing purposes. It is susceptible to bumpy and uneven terrain, and will begin to show signs of damage if it is subjected to too much abuse. It’s best used for residential areas in which the yards are smoother and more even overall. Measuring in at 54 inches, the deck provides a great deal of mowing coverage, encasing 3 cutting blades that will slice through any type of grass that gets in its way. To keep the deck from scalping the yard, 4 roller wheels are attached to its underside. They will completely cut out the risk of scalping, leaving your lawn cut consistently throughout. To lift and lower the mower’s cutting blade, an electronic clutch is easily accessible by foot. You can switch blade heights while driving. A Kohler 7000 26hp v-twin engine supplies the mower with a great deal of power, allowing you to cut at high speeds with consistency and reliability. You’ll be able to cut long stretches of grass quickly, and seamlessly make your way around tight corners, trimming everything in the vicinity with ease. The engine is gas-powered, and works in tandem with a Dual hydro-gear EZT transmission, giving the mower a smooth, powerful, and consistent ride that won’t ever miss a beat. Because of the way the mower is constructed, the engine is provided with a great deal of airflow, reducing the risk of overheating, and ensuring a quality ride that never quits. Online reviewers laud this mower for its ability to cut smoothly, stating that it never leaves any indentations in their yard, and that they can always rely on it not to scalp the grass. Reviewers also give the mower credit for not burning much gas, and for moving at high speeds that allow them to get their lawns mowed quickly. Some online reviewers complained of the mower not having very durable material. They said that it was delivered to them with parts snapped in half, and that it didn’t handle rough terrain very well. They did, however, say that it was simple to send back. It’s important that this mower be used on smooth surfaces as it is not going to handle bumpy terrain well. Overall, the Husqvarna 54-Inch 26 HP Kohler 7000 V-Twin Zero Turn Mower is a great mower for residential mowing purposes. You could attempt to use it for commercial purposes, but the odds of it holding up are not good. But, if you have a large yard that takes a while to mow, the Husqvarna 54-Inch 26 HP Kohler 7000 V-Twin Zero Turn Mower will definitely get the job done for you. It is fast, powerful, and cuts consistently. If you’re looking for a zero turn mower that will do a great job on residential yards, this is the mower for you. It can be purchased for around $3,200.00 on most online retail sites. For the third time, Husqvarna graces our list with one of their fine zero turn mowers. This time, it’s the Husqvarna 54-Inch V-Twin 724 cc Zero Turn Mower; a mower that is strikingly similar to the Husqvarna 54-Inch 26 HP Kohler 7000 V-Twin Zero Turn Mower, but with an identity that is truly its own. A reinforced stamped steel deck makes this mower a great purchase if you’re looking for a mower to handle residential lawn cutting duties. It’s probably not tough enough to handle rough and bumpy terrains, so if you’re in need of a mower that would be suitable for commercial lawn care purposes, this is probably not the mower for you. You would be better served by a mower with a fabricated steel deck. However, this deck is as good as you’re going to find if you need it for residential purposes. Attached to it are four roller wheels that will keep it running smoothly over the ground while preventing it from jutting too low and taking large chunks of grass out your yard. It will completely eliminate the chance of grass scalping. The deck measures at 54 inches and encloses 3 cutting blades that will give your lawn a smooth and consistent cut throughout. To raise and lower the cutting blade, the mower has an electronic clutch. This clutch can be used while mowing, allowing you to lift and lower blade height while the mower’s engine is running. The mower makes use of a Briggs & Stratton 24hp v-twin endurance engine; a powerful and durable engine that is assisted by chrome-plated valves, a premium air filtration system, and an over-sized cooling fan. The mower runs very fast, and its speed can be adjusted through the user of a lever that allows slow speeds for trimming, and high speeds for mowing large stretches of land. The mower is constructed in a manner that allows excellent air flow. This will keep the engine from overheating, and keep grass from building up inside of the deck. A Dual hydro-gear EZT transmission keeps all of the mower’s parts up and running consistently, ensuring that it doesn’t give up on you when you need it. The engine is powered by gas. Online reviewers love this mower for its speed, with one reviewer stating that it cut a huge amount of time off of what it would usually take to mow his lawn. Reviewers also give the mower credit for its power, saying that it cuts through both thick and thin grass with ease. A small complaint made by online reviewers about the mower is that it had troubles cutting the grass consistently when moving at full speed. Though they also stated that this grass was rather tall, which could be a factor. However, the overwhelming consensus was that this mower does a stellar job of mowing down any strand of grass. All in all, the Husqvarna 54-Inch V-Twin 724 cc Zero Turn Mower is a great mower for residential mowing purposes. It offers a powerful motor that ensures a clean, consistent cut all throughout your yard, all at a speed that can be beat. If you’re looking for a high quality residential zero turn mower, the Husqvarna 54-Inch V-Twin 724 cc Zero Turn Mower is definitely a mower you should check out. It can be purchased for around $3,000 on most online retail sites. Purchasing a zero turn mower is a huge investment. You’re not going to find one for under $1,500.00, and even if you do, it might not be worth the money you spend on it. Fortunately, there are some reasonably priced zero turn mowers that will provide you the power and speed you’re looking for. One of these mowers is the Poulan Pro 46-Inch P46ZX Briggs V-Twin Pro 22 HP Cutting Deck Zero Turn Radius Riding Mower. With a 46 inch reinforced stamped steel deck, this mower doesn’t quite cover the same amount of area as other mowers on the list, but it still makes for a great mower that cover lots of land in a short amount of time. 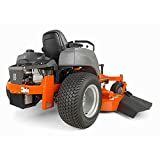 It is recommended that you only purchase this mower for residential mowing purposes, as it isn’t built in a manner that’s meant to endure the damage that can be inflicted by bumpy terrain. It has an electric clutch that can raise and lower the height of the three blades that reside under the deck. This allows you to switch blade heights while riding the mower. The mower has a 22 HP Briggs v-twin pro engine which offers you a great deal of mowing power as well as a great deal of riding speed. This enables you to mow large amounts of grass in a consistent and reliable manner. A Hydro gear EZT transmission helps to keep the mower running smoothly, ensuring it never gives up on you. The engine is powered by gas. Online reviewers laud this mower for how even it cuts, stating that they can ride at any speed without any problems arising. Reviewers have noted that their mowing time has been cut in half by this mower, with one reviewer saying that what used to take 2 hours is now only taking 35 minutes. A complaint about the mower is that its front wheels press down very heavily, leaving track marks all throughout the yard. Reviewers also criticized the mowers ability to cut grass on hills. The mower works fine when going straight up and down hills, but if it is positioned sideways on a hill, it is capable of scalping your yard. Obviously, with something as expensive as a zero turn mower, you’re going to get what you pay for. But, if you’re looking for a very nice zero turn mower at a very respectable price, the Poulan Pro 46-Inch P46ZX Briggs V-Twin Pro 22 HP Cutting Deck Zero Turn Radius Riding Mower could be just the mower for you. 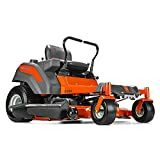 Available for around $2,500 on most online retail sites, this mower will provide you all of the power and speed present in more expensive mowers. It has its flaws, but for its price, it can’t be beat. In general, zero turn mowers come equipped with two different types of deck constructions. These constructions are stamped, and unstamped. A stamped deck construction contains lighter gauged steel that is less expensive to manufacture, but not quite as durable as the steel used in an unstamped deck. This type of deck is best used on residential lawns, as residential lawns are smoother, and therefore cause less damage to the deck overall. Unstamped decks use heavy-gauged steel that is welded together continuously in order to withstand the damage done by rough terrain. For this reason, unstamped decks are most ideally used for commercial mowing purposes. Commercial areas typically have rougher terrain the residential areas, and so the mowers that mow them need to be constructed with more durability. Some decks have wheels attached that help to raise the deck over uneven ground and terrain, preventing the scalping and uneven cutting of grass. Some wheels are permanently attached while others can be removed. Decks that have wheels attached are ideally used for commercial mowing purposes. As with any lawn mower, comfort is one of the most important aspects to consider. You could spend up to an hour on your mower, and if it’s not comfortable, it could do some serious damage to your back, neck, or other body part. Unlike riding mowers with steering wheels, zero turn lawn mowers will require you to lean back instead of leaning forward. This necessitates a seat with a great deal of back support, allowing you to sit back comfortably without aches and pains. You always want to make sure that there is easy access to the mower’s control panel from where you sit. You don’t want to have to twist and lean all over the place just to make the mower function correctly. In addition, you should consider add on features that the mower can accommodate. You may want to cut down on grass collection time. If so, it’s important to be aware of whether or not the mower can have a bag attached it or not. One thing’s for sure; if mowing your yard isn’t a comfortable experience for you, you’re not going to want to do it. Comfort is key. Different lawn mowers are built with different capabilities. Some mowers do as much for the person mowing as possible, while others make the person mowing do almost all of the work. There are several key aspects to consider when you’re surveying how easy a zero turn mower is to use. One aspect is the mower’s speed. Some zero turn mowers move at only one speed. This speed can be either too fast or too slow, depending on how much experience you have with mowing lawns. Luckily, there are zero turn mowers that have adjustable speeds. They allow you to easily speed up when mowing large stretches of grass, while letting you easily slow down when trimming tight and narrow corners. Another important aspect to consider is cutting height. Some mowers necessitate that the person mowing gets off the mower and manually adjusts the height of the blade. This can be very time consuming and inconvenient. You don’t want to have to stop the mower and get off to change the blade height every time you run into a tree root. However, there are also zero turn mowers that allow you to adjust blade height while riding the mower by hitting a button that automatically adjusts the height of the blade. This is much more convenient, and will save you a great deal of time overall. It’s important to work within your budget, but these are aspects of your mower that can be the difference between a good investment and a great investment. Price is probably the most important thing to consider when buying a zero turn mower. You don’t want to overspend on a mower when you can get something just as good for a lesser price. It’s important to think about what you’ll be using the mower for. The size of your yard. How many narrow corners you’ll have to mow. Whether you’ll be using it for commercial or residential purposes. All of these factors can affect how much you spend on a zero turn mower. Commercial zero turn mowers usually hover around $6,000, though they can be found for more and less money. Typically these mowers will be better built with a greater deal of durability so that they can withstand rough and rocky terrains. They will also typically possess more features, such as changeable speeds and automatic blade lowering. Residential zero turn mowers usually cost around $2,000, though they can also be found for more or less. They cost less because they don’t require a construction that is as durable, and because they often don’t have as many features as commercial mowers. However, this is not always the case. There are commercial and residential mowers that can be found for a bevy of prices. It’s important for you to get a sense of the quality of each mower before you go throwing thousands of dollars at it. Buying a zero turn mower is a big investment. Even if you’re buying one on the cheaper side, it’s still going to be rather expensive. Before making the final purchase, it’s absolutely necessary to survey your needs and act accordingly. Different zero turn mowers are made for different purposes, so make sure you choose one that suits your purposes. These mowers can make lawn mowing much easier than it’s ever been, but to maximize your investment, you must partake in a great deal of research. Once you’ve done this, you can revolutionize your yard care by purchasing the perfect zero turn mower for you.